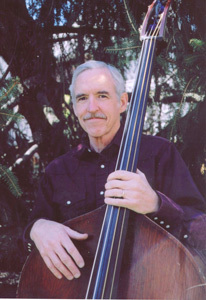 Marshall Wilborn, who is married to Lynn Morris, is one of the finest bass players in bluegrass today. His clear, patient teaching on our bass DVDs has helped many folks learn how to keep good time. Marshall was born and raised in Austin, Texas. His bluegrass credentials include membership in some of the music's most respected and influential traditional bands - Jimmy Martin, The Johnson Mountain Boys, Longview, and the Lynn Morris Band. Other artists have recorded his songs as well - folks like Alison Krauss, Rhonda Vincent, Doyle Lawson, The Johnson Mountain Boys and, most recently, Jeannie Kendall. Marshall produced and recorded his own instrumental album on the Pinecastle label, Root Five, a tribute to the banjo and bass playing that has inspired him throughout the years. The album was nominated for Instrumental Recording of the Year by the IBMA and features some of the finest banjoists in bluegrass, along with Marshall's powerful and tasty bass work. Marshall currently plays with Michael Cleveland and Flamekeeper. In 2009 he won the IBMA Bass Player of the year Award, and the band won Instrumental Group of the year, as they had done for the past two years.